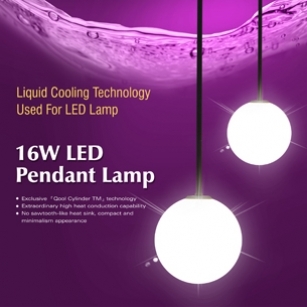 Goldyear also applies liquid cooling technology to its 16W heat LED column pendant lamp, which is outfitted with a patented “liquid cooling column", an effective, innovative thermal-dissipation solution developed by Goldyear. The high-tech liquid cooling column has an extra high efficient heat conduction ability. The heat created from the LED is transferred to the liquid cooling column instantly and uniformly, then dissipated by natural air convection. The LED temperature can be always kept under 55°C, it extends the LEDs life span and keeps the brightness all the time. With liquid cooling technology, sawtooth-like heat sink is no more necessary. Without the eyesore heat sink, this is why LCP-16W can keep a compact and minimalism appearance. LCP-16W is a contemporary round opal glass pendant luminaire for diffused lighting. Ideal for many places like museums, art galleries, restaurants, and household areas.